New innovative technology to assist Dutch National teams The Royal Dutch Equestrian Federation (KNHS) welcomes Equestic as a new partner. 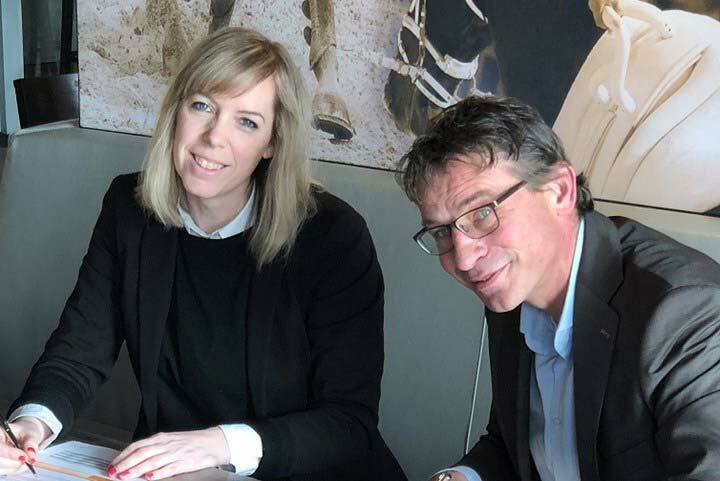 Today Leon Rutten, CEO of Equestic and inventor of the innovative SaddleClip and Esther Hendriksen, head of Communications, Marketing & Sponsoring of the KNHS signed the partner contract. “We are very pleased that we can contribute to the international success of the Dutch equestrians. The Dutch equestrians and the KNHS have a great international reputation. This partnership enforces our reputation and will contribute to the international adoption of the Equestic SaddleClip “, says Leon Rutten. Esther Hendriksen is enthusiastic about the collaboration. “The SaddleClip enables our coaches and top riders to measure and analyze their training in a much better way. This gives us insights into where we can still take steps to improve Dutch top sport performances. It also provides insights into the training intensity, so we can better monitor the risks of training overload. ” Equestic SaddleClip The SaddleClip is a sensor that measures and analyzes the training of horses. You want a Happy Athlete that delivers a top class performance and intensive training without excessive physical effort. The Equestic SaddleClip provides insights into these aspects and reveals training habits and progress. Monitor your training programme and use the data collected by the Equestic SaddleClip to adapt your training routines. This data can be shared with your trainer, vet, farrier or the horse’s owner. As a team, you can decide on the best training regime for optimum performance and maximum welfare. The Equestic SaddleClip is simple to use. Just clip it on with one hand and off you go. Clip, Ride & Improve! The Equestic SaddleClip is available at the larger online and offline equestrian shops in the Netherlands and a growing number of shops internationally. The recommended retail price is € 249,95. The accompanying mobile app can be downloaded for free in the App and Play store. Visit www.equestic.com for more information about Equestic and the SaddleClip or contact Equestic through info@equestic.com.